A young music-loving boy is transported to the land of the dead after he steals a guitar on Dia de Los Muertos. In order to return to the land of the living, he must receive the blessing of his ancestors who hate music and want to forbid him from ever playing it. Pixar has a *mostly* excellent track record with us. We have at least liked all their films... well, apart from "Cars 2" and "Cars 3." "Coco" is Pixar's first film in about two years that hasn't been a sequel to a previously released feature. When we first saw the trailer for this movie, it looked like it would be very similar to the animated feature "The Book of Life," which came out in 2014. We have to admit, the visual similarities hampered our excitement for this a little bit. Never judge a book by its cover (or in this case, trailer). Despite both features revolving around Dia de Los Muertos, they are each very different films with very different themes. "Coco" is about a young boy named Miguel, voiced by Anthony Gonzales. He loves music and wants to be a musician. However, he learns that many, many years ago, his great-great-grandfather abandoned his family to follow his dream of musical stardom. Because of this, his family now hates music and will not allow it in their home. When Miguel steal his great-great-grandfather's guitar on Dia de Los Muertos to play in a talent show, Miguel is transported to the land of the dead where he needs to obtain the blessing of his music-hating deceased family in order to return to the land of the living. Also providing their voice talents for the film are Gael García Bernal as Héctor, Benjamin Bratt as Miguel's great-great-grandfather Ernesto de la Cruz, Alanna Ubach as Mamá Imelda, and Renee Victor as Miguel's Abuelita, just to name a few. With each and every release, Pixar's animation gets better and better, and "Coco" is no exception. This film is visually stunning and gorgeous to boot. There are some scenes where the backgrounds are so photo-realistic, it was hard to convince ourselves that it was animated and not shot on location somewhere. The wrinkles on people's skin look real. The marks and scars people bear look like real marks and scars. Their sand looks like real sand. It's insane! Like most Pixar films, "Coco" finds a balance between lighthearted fun that will appeal to a younger crowd and some more mature themes with an emotional punch for the adults in the room. They sure do know how to strike an emotional chord, and while we didn't think we'd get gut-punched by the Pixar machine, sure enough, we both left the theater having cried a good amount. We love that Pixar doesn't treat children like idiots who can't comprehend complex facets of life and we really like how they don't resort to pandering to the lowest common denominators with their comedic elements. That being said, some aspects of this film are a bit predictable and it winds up being a mostly formulaic story about following your dreams and the importance of family. As we've said many times here on this site, just because something is rehashed doesn't inherently make it bad, and this movie just so happens to be really, really, really good. The voiceover work is excellent and it is still a great and entertaining watch despite its familiarity. "Coco" is the frontrunner for the Best Animated Feature category at the Oscars, and rightfully so. None of the other widely released animated films this year stand a chance against Pixar's latest beast unless a limited release indie film upsets their win. 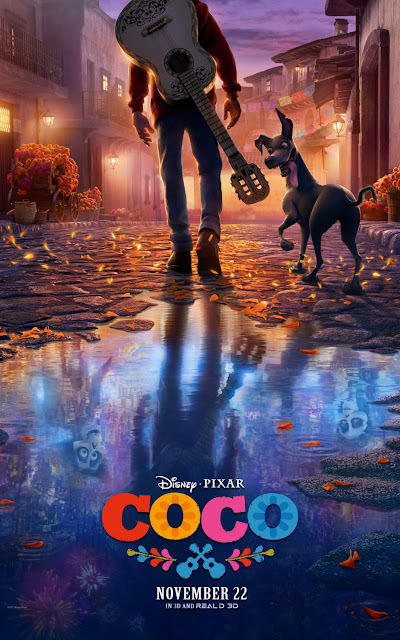 "Coco" is one of the few animated films this year that is truly worth your money and time. It's important, powerful, inclusive, vibrant, and fun. It's a fantastic watch for everyone.